Ahead of LÉON’s Ones To Watch–presented ‘You And I’ tour, we had the pleasure of inviting the Swedish songstress to perform an acoustic rendition of “You And I” from her critically-acclaimed self-titled debut album. Captured atop our rooftop in iconic Hollywood, LÉON’s heart-stirring performance made it clear as day why she is undoubtedly one to watch. LÉON’s soulful take on pop is intoxicating. First making a splash in 2015 with a sound that evoked the pop sensibilities of the ‘60s and ‘80s, while still remaining ever forward-thinking, LÉON’s sonic musings have captured the attention and hearts of fans and critics alike. It is an innate gift for musicality that the Swedish songstress had developed over the years and explores in full in her acclaimed self-titled debut album. 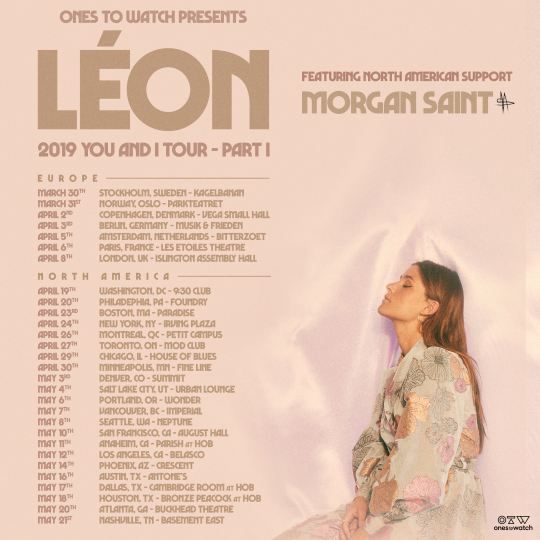 To witness the soulful pop magic of LÉON live, alongside the left-field pop of Morgan Saint, be sure to find your city below and grab your tickets to the ‘You And I’ tour! Still need more LÉON in your life? We don’t blame you. Revisit our 2017 “All Eyes On” performance with the soulful Swedish talent below. March 1, 2019 LÉON is ready for the limelight.